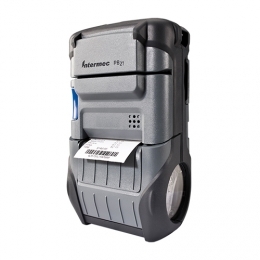 The Honeywell PB21 is a robust mobile printer for sales slips, invoices, packing slips and receipts. It also quickly and crisply prints more graphically complex receipts. A standard 16 MB RAM ensure for a high print speed of more than 100 mm per second 203 dpi or 8 dots/mm, respectively. In this fashion, it expertly supports mobile processes in logistics and transportation facilities, as well as mobile POS applications during events and in retail. With a maximum media width of 57 mm you utilize it flexibly. Various sensors provide both current status and error messages continuously on the practical LCD display.